Post by Cathy • Katie and Keth wanted a reclusive spot for their outdoor ceremony and discovered the beautiful County Line Orchard in Hobart, Indiana. When guests arrived, wooden signs (handcrafted by the groom) directed guests to hop on a tractor-pulled wagon, which carried them to the ceremony site nestled in the orchard. We’ve been so lucky this year to have so many outdoor weddings, surrounded by nature — something we both love. Being able to shoot an orchard wedding is just the start! At the reception, held in the rustic red barn, Keth surprised Katie by pulling out his guitar and singing to her, accompanied by a few of his groomsmen singing backup. The couple decorated with a number of personal touches, including Star Wars cake toppers and cork place card holders. My favorite touch was their twist on a guest book: a wine rack full of empty bottles, each marked with a different anniversary year of their marriage, for guests to place messages in. At the end of the night, the bottles were corked and won’t be opened until the anniversary year of each bottle. During the reception, the couple and their friends and family partied away the rest of the night with dancing, doughnuts, in our Photo Booth (blog entry coming soon). We seriously have had such an adventure with these two, from their destination engagement session in North Carolina, to David sending Keth inspiration for new wood working projects on Facebook. We hope to see this super sweet couple again down the road and wish them the very best. You guys are amazing. Where did you go on your honeymoon? • Last fall over a long weekend we took an amazing trip to San Francisco and Napa Valley, and we had such a great time with the mix of hustle and bustle in the city, and then a few days of wining, dining, and relaxing in wine country. We wanted to recreate that for our honeymoon. We heard a lot of great things about Kauai. It had plenty of hiking and opportunities for adventures, but also tons of beautiful beaches to just relax and soak up the sun with a drink in our hands. Since we were heading west, we wanted to stop in Seattle to explore a cool city we had never been to. 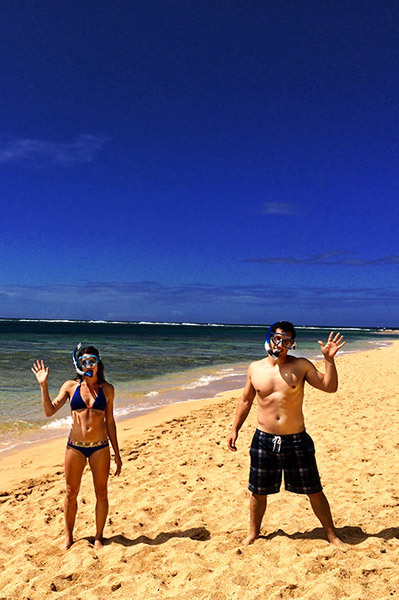 It just happened that Seattle was the layover from Chicago to Kauai, so we had direct flights to both places! What was your favorite adventure? • LI think our favorite adventure was kayaking down the Wailua River, then parking the kayak and hiking to the “secret falls.” There was a rope swing on the river that Keth LOVED, and the hike was quite challenging and muddy due to a very large amount of rain over the past week in Kauai. It was amazing to see the waterfall so close up, and Keth and I were able to swim in the water and even behind the falls. What was the best thing you ate? • We loved Jo Jo’s Shave Ice in Waimea. The best on the island! What was your favorite part of the wedding day? • Keth said his favorite part of our wedding day was “getting married to me”. My favorite was Keth’s surprise performance of “Stolen” with the guys at the reception. I am a lucky, lucky girl to have such a handsome, creative, talented husband add such a unique touch to our wedding. Do you have any advice for couples getting married? • My advice for other couples would be to let others help you. If you’re like me and have a hard time making decisions, hire a wedding planner!